Apple’s Mountain Lion update to Mac OS X is an affirmation of just how important the cloud and iOS integration has become to anyone who uses a desktop Mac. More than 100 new features have been added to the operating system, and many emphasize Apple’s desire to create a single platform that integrates mobile, social and cloud features across multiple devices. The message is clear: Whether you’re on a MacBook, iPad or iPhone, you’re working on an Apple product that’s directly linked to other hardware in the same ecosystem. The personal computer is no longer the primary device in your digital life — it’s a node in a larger ecosystem that encompasses the whole Apple family. And device-to-device synergy is just the tip of the iceberg. We’ve teased out five of the most important, most innovative aspects of Cupertino’s latest release. Mountain Lion is also about iCloud. You first sign into the OS using your Apple ID, allowing services like iCloud, iTunes, the Mac App Store and FaceTime to set up automatically. 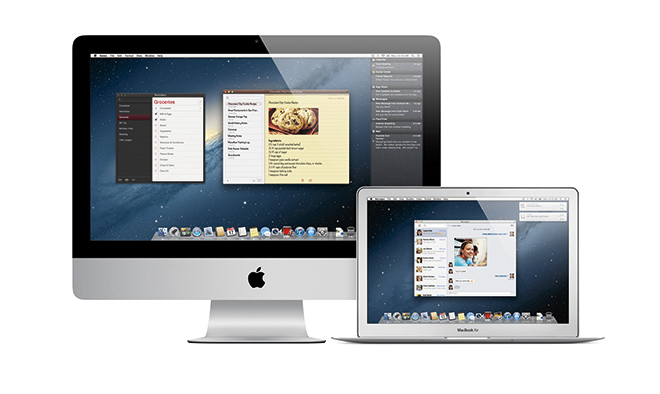 Accordingly, Mail, Calendar, Contacts, Messages and Find My Mac all easily sync once you set up iCloud. Mountain Lion also gives you two built-in ways of storing files and documents: directly in your computer, or in iCloud. You can choose to store information in either place, freeing you from the tethers of localized storage. By all accounts, it should be a dead-easy implementation — and services like Dropbox can’t be too happy about Apple’s new built-in cloud features. Mountain Lion will also include a feature called iCloud Documents, which lets you store documents in the cloud and sync document changes, a la Google Docs, to all your devices. You can also organize files into folders in iCloud, and share them through email, Messages or AirDrop with the click of a button. A number of iOS carryovers like Notes and Reminders use iCloud to sync information and alerts across your Apple ecosystem, providing the closest thing to a completely unified cross-device computing experience that we’ve seen so far. Notification Center was one of the major new upgrades made to iOS 5, and with Mountain Lion, the useful notification aggregation center is now on the Mac, too. Notification Center looks almost identical to its mobile counterpart and normally stays hidden under the right side of the desktop screen. When you get a notification, it pops up on the top-right of your screen as a banner that disappears on its own after about five seconds. And when you get an alert, which requires user action before it disappears, an icon on the far right of the menu bar turns blue. Click it, and your desktop slides to the left to reveal Notification Center. If you’re on a MacBook Pro or Air, or have a Magic Trackpad, you can also bring up Notification Center with a two-finger swipe from its right edge. Privacy and security is a growing concern of app users (just look at the whole Path debacle). 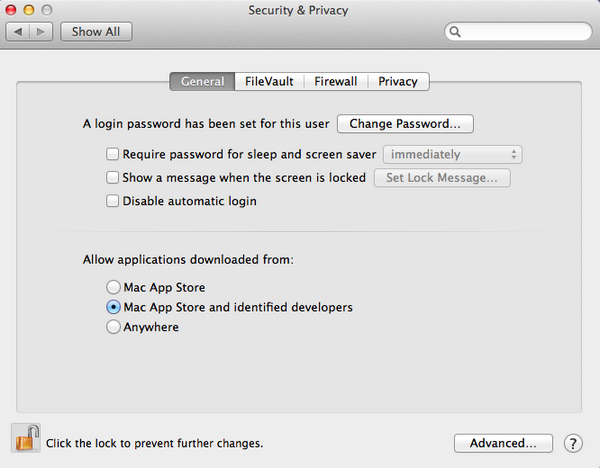 But while iOS privacy policies are a work in progress for Apple, the security of your desktop system is a front-and-center concern in Mountain Lion. Now it’s true that Mac OS X has been largely immune from the malware issues that plague other operating systems like Windows and Android. The MacDefender malware scare in mid-2011 was an exception, and it looks like Apple now wants to stay one step ahead of the bad guys with a new feature called Gatekeeper. Gatekeeper gives you the ability to control which sources you download applications from. For now, you can choose between the Mac App Store only, the Mac App Store and identified developers, or (if you like to live dangerously) from any and all sources. But with Gatekeeper set on a tight leash, you can ensure that you don’t accidentally download an app that has some malware secretly tacked onto it. The middle setting — the Mac App Store and identified developers — is the default. Gatekeeper is a feature Apple is heavily working on, so the language in the screen shot and the areas you have control over could change by the time Mountain Lion ships later this year. 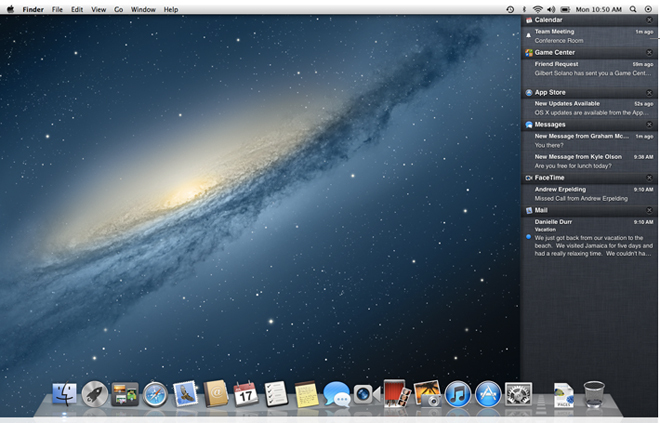 Mountain Lion delivers strong unification between iOS and Mac. For starters, Apple unified and simplified the naming conventions of many of its features (iCal is now Calendar, iChat is now Messages), paring down some of the “cruft,” as Daring Fireball’s John Gruber put it, that’s accumulated over the years. Here are four ways Apple is bringing iOS and the Mac together. Notes: Notes looks much like the iOS version of the app — a yellow, lined paper notebook — but with a UI tweaked for the desktop. It supports rich text, and also supports links and inline images. You can share notes via email or iMessage, and you also have the ability to pin it on the top of your screen like a Post-It. It syncs with iCloud, but can also sync with other services like Gmail or Yahoo. Messages: What used to be iChat now integrates with iOS 5′s iMessage service, as well as FaceTime. Messages makes chatting seamless across whatever platform you’re chatting on, and whatever device you’re using. It combines text messages and instant messages (from sources like AIM, Google Talk, and Jabber) so you can access them and search through them on the desktop. And with iCloud, you can access iMessages on any device, whether it be your iPhone, iPad or MacBook. This feature is available as a free beta to current Lion users. Calendar: Calendar replaces iCal, and keeps the same faux-leather design as it did in Lion. It has undergone a few slight tweaks, like the ability to turn off invitation alerts without turning off meeting reminders, and one feature, Reminders, has been removed. Reminders: Removed from Calendar, yes, but it’s become its own standalone app, like it is in iOS 5. Reminders syncs with iCloud and across devices, as well as services like Google Calendar. It’s got the features you’ve come to expect from Reminders, like the ability to set priorities, make lists, and set alerts. One difference from the iOS 5 version is that there are no location-based alerts. Another iOS import, Game Center, is also coming to the Mac, giving you the ability to check out game titles your friends are playing, discover new friends, and view your leaderboard status, among other things. But the introduction of Apple’s new Game Kit API’s should also open up a whole new world of gaming. Developers will now be able to create games that work across the Mac and all iOS devices. 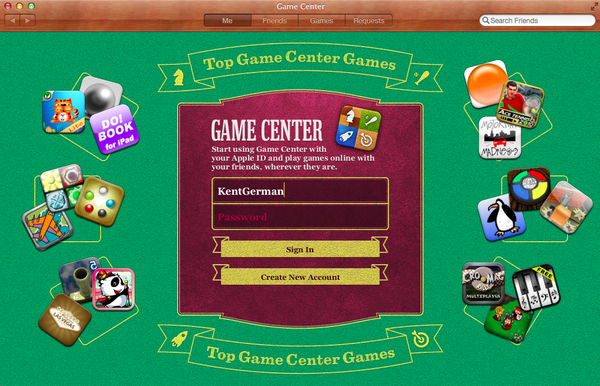 For example, you could create a multiplayer game with one opponent on an iPad, one on an iPhone, and another on a Mac. Suddenly, developers now have much larger potential user bases, and players have much larger potential opponent bases. Games will be able to use enhanced Multi-Touch features like double-tap to zoom, so you can get a close-up look at onscreen action. Apple has also implemented a new graphics backbone that can enhance OpenGL apps. The fact that a single game can be played across all manner of Apple devices now opens up interesting possibilities for multiscreen gaming. If a game can be played on multiple devices, it’s not a big jump for those devices to interact with one another in an individual game, which opens up some seriously cool options.